In a change from previous releases Topps did not include checklist card backs in the new 2016 GPK Apple Set. However, Topps has released a checklist of cards names that can be found in the set. 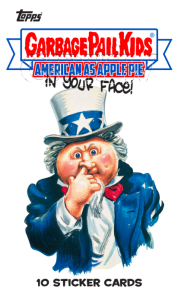 Click here to see Topps 2016 GPK Apple Pie Checklist. This entry was posted in 2016 GPK Pie, Checklists, Uncategorized and tagged 2016 GPK Pie, Checklist by Jeff. Bookmark the permalink.